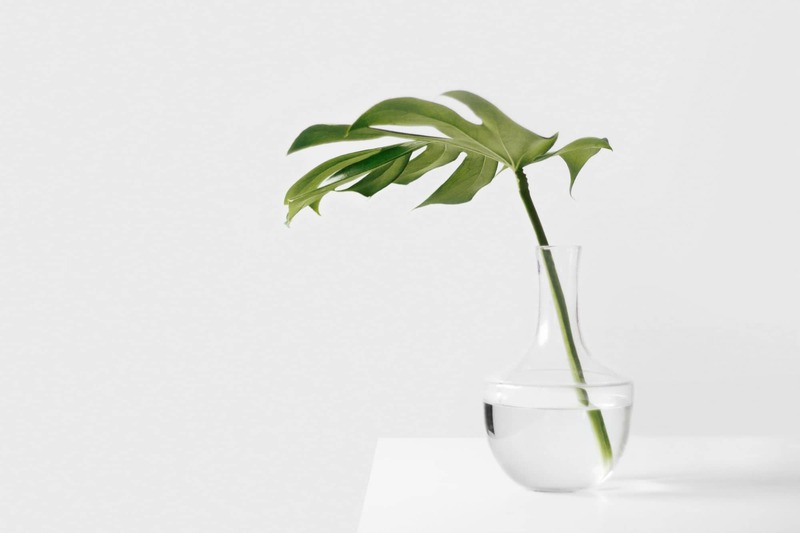 Server backup software for growing businesses who need reliable, automated protection, without great complexity or expense. Reliable server backup doesn’t have to be complicated. Or expensive. 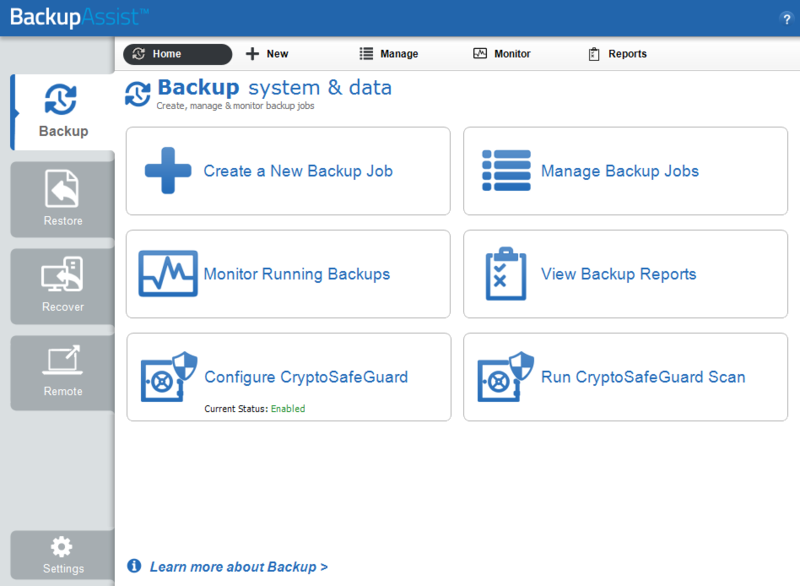 BackupAssist provides all of the tools you need to protect both physical and virtualised servers, without draining your IT budget. 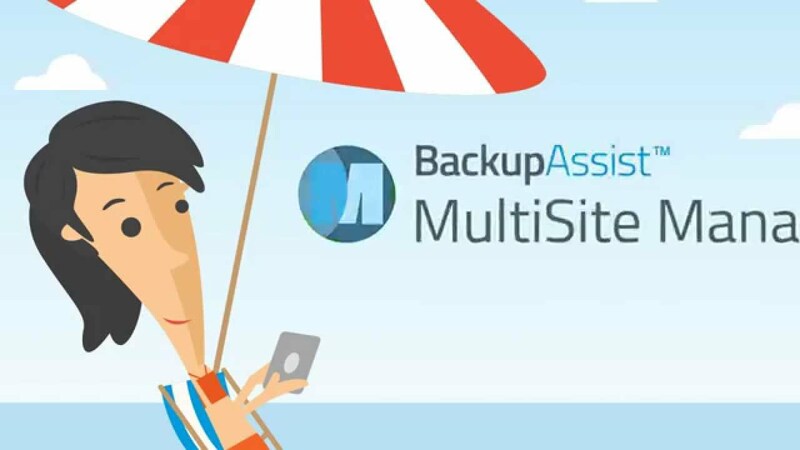 Create an automated, reliable backup strategy in minutes. Incorporate imaging backups for Bare Metal Recovery (BMR) of your server to dissimilar hardware, file backups, and application protection such as for Microsoft Exchange and SQL Server. Every media type has strengths and weaknesses. 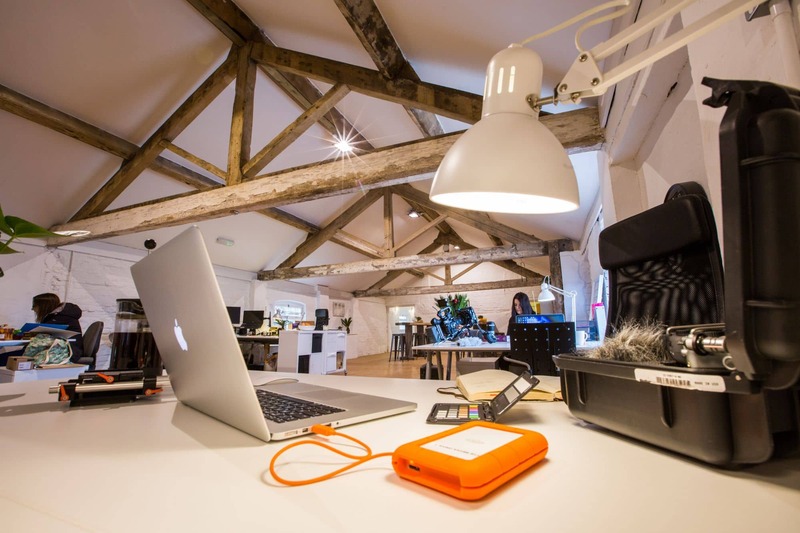 Off-site backups will protect you from fire and theft, but bandwidth can sometimes limit data retrieval speeds. Local backups to USB and RDX don't have that limitation, but can't offer the same level of automation and arguably, security. 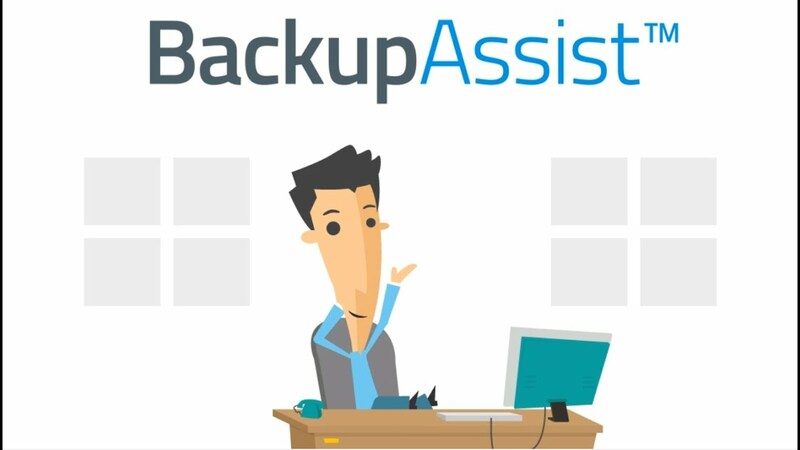 BackupAssist provides the best of both worlds, supporting pretty much everything you can throw at it, including external hard drives, RDX, tape, NAS devices, remote servers, cloud providers and more. Expand the functionality of your BackupAssist licence with the following add-ons, all of which inherit the upgrade cover of the core BackupAssist application. 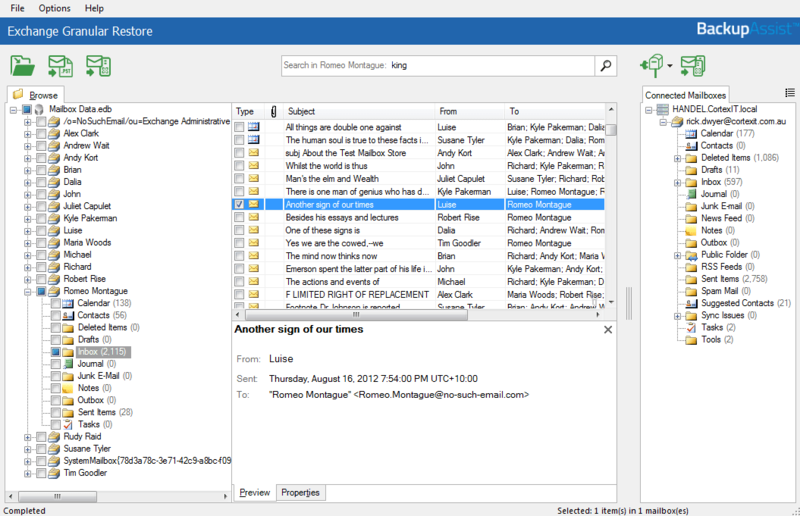 Highly recommended if you use Microsoft Exchange, this add-on provides the ability to query your backups and restore mailbox data such as individual emails, mailboxes, calendars and contact data. 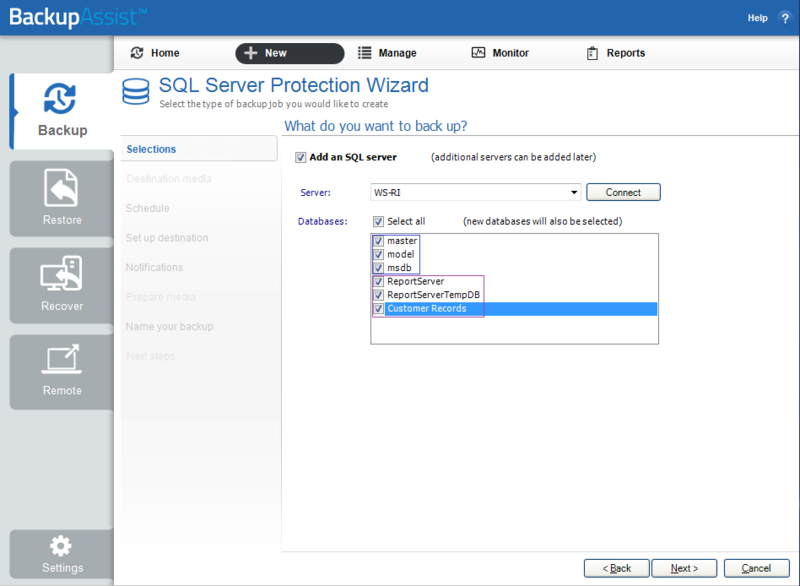 Add continuous protection for your SQL Server. Using transaction logs, this add-on enables you to restore to a point in time, which is ideal for high activity sites where a once per day backup isn't sufficient. Also provides support for the backing up of remote SQL server installations. Add fast, incremental, encrypted backups of your files to the following off-site destinations for extra insurance against data loss. 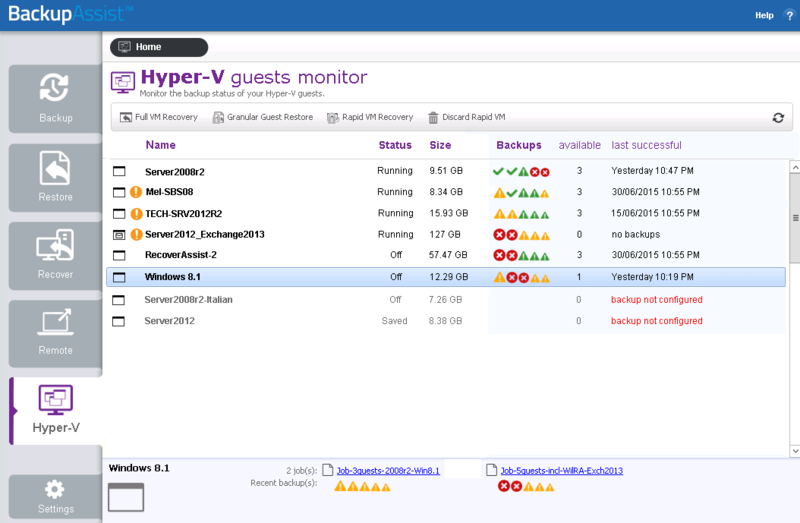 Install BackupAssist at the Hypervisor level to provide a single pass backup of your entire Hyper-V machine. Drill-down into guest VM’s to recover files and when used together with the appropriate add-ons, restore granular data from Microsoft Exchange and SQL Server. 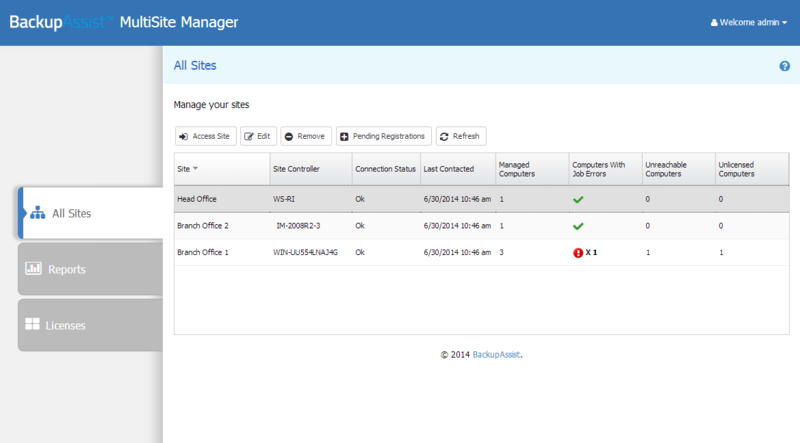 Ideal for IT support companies and MSP's, the MultiSite Manager is a separate application, normally run on a machine at your office, that connects remotely, providing central management and monitoring of multiple BackupAssist installations. CryptoSafeGuard protects your backups from ransomware by stopping infected files from being backed up and preventing your backups from being encrypted. 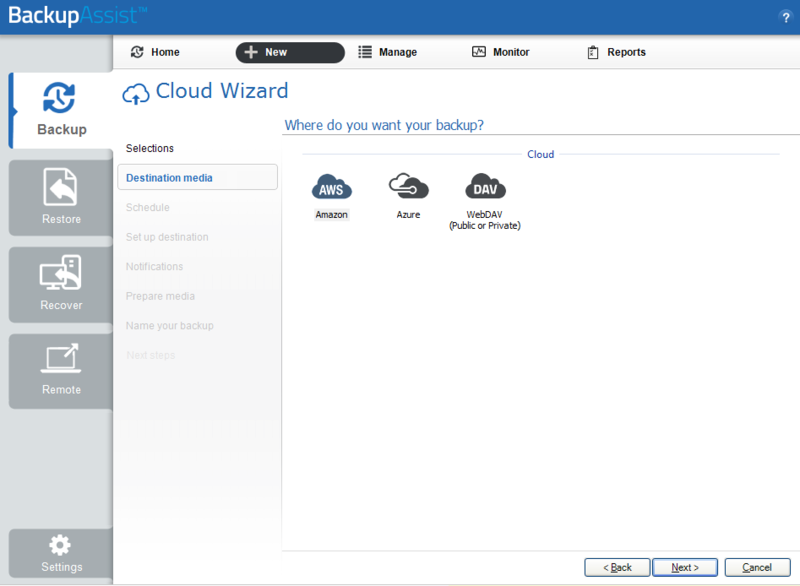 This feature is included free in any copy of BackupAssist provided it has valid upgrade protection. possible infections in source files. to attacks by blocking jobs. administrators via email and SMS. Products that do what they're supposed to, an experienced support team and a sunny disposition are just a handful of the reasons to join over 1000 other IT support companies and MSP's who've become reseller partners.